Have action figure reviews - will travel. Paladin is a mercenary marksman who always has his eye on the bottom line. And also on the bottoms - Paladin is kind of the Barney Stinson of the superhero set, flirting with pretty much every woman he meets. And often closing the deal, too; in fact, he briefly dated Wasp while she and Hank Pym were on a break. 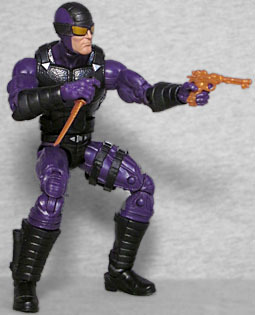 He's not really a hero, though: the character was introduced in Daredevil #150, as a bounty hunter looking for the Purple Man, and while he's mostly been on the good guys' side since then, dude's still a mercenary; he works for whoever pays him. For instance, during Civil War, he joined Misty Knight's Heroes for Hire team, but only so they could lead him to Captain America and he could hand Cap over to SHIELD. 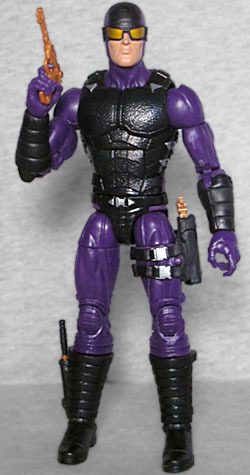 This version of Paladin seems to come from his time with the Thunderbolts, judging by the colors - his classic look is purple armor over black clothes, while this is black armor over purple clothes. Personally, I'd have liked the old suit better, but hey, that's just me. There's a pad running over the top of his head like Constrictor, but Pally wears goggles and doesn't have fangs, so that isn't reused. The reason they chose this colorscheme is apparent: in addition to the head, the forearms and boots are also new molds, and to really re-create the old look, they would have had to make him a new torso, too. By changing to the newer style, with its modern-style bodyarmor, they're able to reuse Blade's mold. The left leg still has that weird bump on it that's been there since the Electro days, and they're still trying unsuccessfully to hide it by strapping something to the thigh - in this case, a holster. Unfortunately, while Paladin comes with two guns, they don't fit the holster, because it was designed for a different kind of gun. Maybe if you poked a hole in the bottom of the holster, so the gun barrel could fit through and the grip would sit down as far as it should? Might be worth a shot. These (and the knife) are ones we've seen before, and they're done in gold. Because Paladin likes to look classy. He can store the knife in his boot, and one of the guns loosely in that holster, but the second gun will have to be held in his hand forever. Naturally, he has a piece of this series' Build-A-Figure; the massive, orange-furred right leg of Sasquatch. This look for Paladin isn't his most famous, but we're probably never going to get that one. 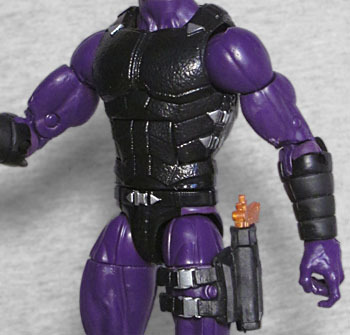 This one at least keeps the main colors, even if they're reversed, and it allows Hasbro to reuse a fairly unique mold.